Can Vail’s Philippon salvage greatness of injury-plagued Tulowitzki? Troy Tulowitzki (Colorado Rockies photo). On Sunday, the Colorado Rockies will officially retire the number of the greatest player in franchise history – the No. 17 of first baseman Todd Helton. Unfortunately, I don’t think the Nos. 2 and 5 of Troy Tulowitzki and Carlos Gonzalez will ever be joining the Todd Father’s along the upper deck at Coors Field. Tulo and Cargo have been far too plagued by injuries, and now comes news that they’re both once again done for yet another lost season – Tulo with a torn labrum in his hip and Gonzalez with knee problems necessitating surgery Monday. That’s not good if you’re en elite Major League shortstop pushing 30. Tulo was killing it with a .340 batting average, 21 homeruns and 52 RBIs – on pace to win a National League MVP Award – and now his ninth season has ended the way many previous seasons have ended: on the DL. Marc Philippon (Dan Davis photo). Tulo will undergo hip surgery in Vail today, placing his future in the very capable hands of Dr. Marc Philippon, who has extended the careers of many great athletes. But one has to wonder if Tulo will ever truly be able to return to All-Star form and get the Rockies back to the playoffs the way they rolled in his rookie season and then again in 2009. It’s been very bleak since then, although not nearly as bleak things have been in Kansas City (go Royals!). I grew up in Washington, D.C., a fan of Baltimore’s great offensive shortstop, Cal Ripken – baseball’s ultimate iron man. So to witness Tulo’s endless string of injuries is disheartening. I’ve also been an outspoken critic of the Rockies’ front office, but I can’t really fault them for sticking with Tulo and Cargo all these years. In fact, I have to credit them for trying to lock up two great young superstars with long-term deals and resisting the temptation to trade them prematurely. It’s easy to say in hindsight that they should have been traded sooner. Dr. Marc J. Philippon of Vail’s Steadman- Philippon Clinic credits golfing great Greg Norman with giving his career as an orthopedic surgeon a huge boost by allowing the Great White Shark’s 2000 arthroscopic hip surgery to be broadcast live on the Internet. “Marc essentially saved me from a total hip replacement,” said Norman, a two-time British Open winner who owned a ranch northwest of Vail and designed the Norman Course at Vail Resorts’ Red Sky Ranch Golf Club near Wolcott. 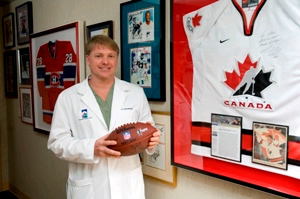 Philippon counts among his patients Mario Lemieux of the NHL’s Pittsburgh Penguins, Olympic gold medal figure skater Tara Lipinski, NBA basketball star Marcus Camby and Pro Bowl NFL running back Priest Holmes. After her gold-medal win in the giant slalom at the 2006 Torino Winter Olympics, ski racer Julia Mancuso had her hip scoped by Philippon, who acknowledges that “skiing is a risk sport.” But he adds that diagnosing the problem early and using arthroscopy can keep young athletes active and avoid osteoarthritis and eventual hip replacement. Such statements fit seamlessly into the broader Steadman- Philippon philosophy of preventing full joint replacements through exercise, diagnosis, arthroscopy and rehabilitation. Which explains in part why Philippon in 2005 joined the Vail-based clinic founded by renowned knee specialist Dr. Richard Steadman, coming over from the University of Pittsburgh School of Medicine’s Department of Orthopedic Surgery. Steadman, the U.S. Ski Team physician who prolonged the careers of athletes from Joe Montana to Dan Marino to Bruce Smith to Bode Miller, is an equally big fan of Philippon.